Not too long ago, Rowena had an obsession with oxtail soup that also piqued my own obsession. Our local Costco just started carrying oxtails in their meat section and I immediately snagged a pack with this particular soup in mind. Whenever I can get ahold of some oxtails I inevitably plan on cooking kare-kare, a peanut butter based stew with vegetables. Now with this soup, I have added to my oxtail prep repertoir. Whenever I visit my sisters in Los Angeles, one of our stops is King’s Hawaiian Restaurant and Bakery in Torrance where one of us (mostly me) would almost always order the oxtail soup. 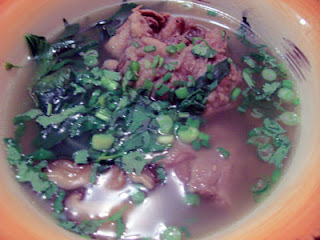 The Hawaiian oxtail soup, I learned is a Chinese recipe adapted by the Hawaiians. My version, admittedly, is not half as good as King’s; I don’t know what their secret is but their soup is just wonderfully flavorful. This was quite flavorful too, what with the addition of the herbs and spices, the smell was delicious. Rowena provided two links for recipes, here and here, which I combined to make this version. I was intrigued by the addition of whiskey but unfortunately it was a Sunday when I decided to cook this soup and the state run liquor stores were closed (that’s a law here, no liquor sold on Sundays). In a stock pot, parboil oxtails for 30 minutes. Rinse the oxtails and the pot and add more clean water to the pot. Bring the water back to boil and add oxtails back in along with the Szechuan peppers (wrapped in cheesecloth so they are not floating all over the soup), shiitake mushrooms, gow pee, star anise, and ginger. Salt & pepper to taste. Bring to a boil and simmer until the oxtails are falling off the bone tender, about 2-3 hours. Replenish the soup with additional broth or water if it starts getting too low. Skim as much fat as you can from the surface as the soup cooks. Just before serving, add the mustard cabbage and cook just until it wilts and changes color. Serve with the garnishes to be sprinkled on top and rice. I haven’t tried oxtail soup yet… sounds delicious! Hi Freya and Paul, I’m glad you stumbled across our blog. I hope you do try this recipe. It’s perfect comfort food. Just stumbled across your blog – I love the design of it, really great! I have just ordered some oxtail so this is a great idea for a recipe! hi sis, that’s my next project is to make a decent pho. Hi stel! sure gaya away 😀 ganun din ginagawa ko sa blog mo. hehe! Too bad, wala kaming cable. Would love to see KSS again. I even looked into buying the DVD pero ang mahal! Thank goodness for youtube. looks great JMom! gaya gaya me ha? As Ange would say, “Slurp”! I love Kings oxtail soup (and The California Hotel Cafe in Las Vegas’s also has a good one) even hubby has acquired a taste for it! I love that beef broth taste,too; in oxtail soup and in Vietnamese Pho.